The New York Giants held their thirteenth summer training camp practice on Monday at Quest Diagnostics Training Center in East Rutherford, New Jersey. The New York Giants have waived/injured wide receiver Kevin Norwood (injured hip during practice on Sunday) and tight end Colin Thompson (appendectomy on Saturday). To fill those vacant roster spots, the Giants signed wide receiver Andrew Turzilli and rookie free agent linebacker Chris Casher (Faulkner University). Turzilli was originally signed as an undrafted rookie free agent by the Tennessee Titans after the 2015 NFL Draft. He has spent time with the Titans (2015), San Francisco 49ers (2015), and Detroit Lions (2016-2017), but he only played in three NFL games. The Lions waived him in May. Turzilli is a tall (6’4”, 195 pounds) wideout with a good catch radius and sneaky deep speed. Casher was signed by the Oakland Raiders as a rookie free agent after the 2017 NFL Draft. The Raiders waived him in early August. A highly-regarded prospect coming out of high school, Casher has good size (6’4”, 260 pounds). Casher suffered a number of serious knee issues and was involved in off-the-field incidents at Florida State before transferring to Faulkner University. Norwood was originally drafted in the 4th round of the 2014 NFL Draft by the Seattle Seahawks. Norwood has spent time with the Seahawks (2014), Carolina Panthers (2014-2015), and San Diego Chargers (2016). The Chargers terminated his Practice Squad contract in November and he was then signed by the Giants to their Practice Squad. Norwood has played in 10 regular-season games with two starts. He has nine career receptions for 102 yards. 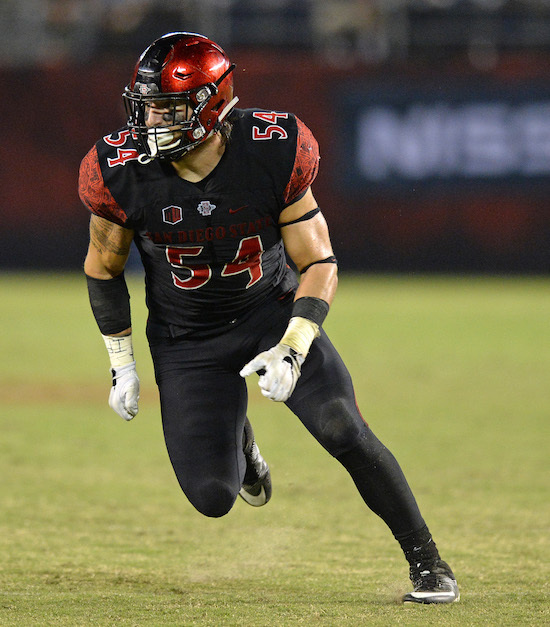 Thompson was signed by the Giants as an undrafted rookie free agent after the 2017 NFL Draft. Running back Shaun Draughn (ankle) and linebacker J.T. Thomas (knee) remain on the Physically-Unable-to-Perform (PUP) List. Wide receiver Tavarres King (ankle), wide receiver Kevin Snead (lower body), linebacker Mark Herzlich (stinger), safety Duke Ihenacho (hamstring), and safety Ryan Murphy (lower body) did not practice. Linebacker Keenan Robinson (concussion protocol) and linebacker Devon Kennard (unknown) were limited. Defensive tackle Corbin Bryant was carted off of the field after suffering a right elbow injury. He appeared to be in a lot of pain. Overcast/Cloudy day, very comfortable temperature. Second-to-last day of training camp and it was the sloppiest practice I saw from an execution standpoint. A lot of mental mistakes. Aldrick Rosas got the “live” field goal attempts today, he was perfect until the final attempt where he went wide right. I think it was from roughly 50 yards. Got a few looks at the newest O-Lineman, Corin Brooks. He is playing guard and appears to have a solid, developed body. He was beat off the ball by DE Romeo Okwara. He struggled to move laterally with any sort of power presence and was easily pushed back. Training camp body-only I think. This was the worst OL day of camp in my opinion. LT Ereck Flowers was getting beat on what seemed to be literally every play by DE Olivier Vernon. Inside, outside, bull rush, double moves…it didn’t matter. He just didn’t look competitive out there. There was one play where Vernon faked inside, jump-cut outside, and reached Manning without even being touched. He and Bobby Hart were both responsible for false starts within a few plays of each other. Not good. OG D.J. Fluker ended up on the ground one play, clutching his ankle but he limped off and was back out there a little awhile later. He and RT Adam Bisnowaty were beat badly on a stunt by DT Jay Bromley and DE Kerry Wynn. Fluker seems to really struggle with reads and quick decisions while pass blocking. He can be fooled and he doesn’t have the necessary make up speed. OC Brett Jones really struggled. He lost a lot of battles when he was asked to move laterally. The backup C job is his as of now, but I don’t think it is locked up. Adam Gettis is right behind him and brings a bit more versatility. RB Paul Perkins was getting stuffed trying to run inside all day. He also had a bad drop from Manning in the red zone with nobody around him. The backup WRs had a hard time separating from man coverage today. A lot of these backups are physical, solid pass catchers but they don’t have the speed or quick twitch to run themselves open. WR Roger Lewis has the ability, but he is still very rusty when it comes to the nuances of route running. Odell Beckham is constantly in his ear about how to get off the line and away from the CB in small areas. The TE battle is becoming more clear to me. Will Tye will be the odd man out as well as training camp MVP candidate Matt LaCosse. Still have a ways to go though. Tye saw the perfect storm come his way this offseason, a free agent and a 1st round pick were brought in from the outside at his position. In addition, a 2016 draft pick in Jerell Adams was a one- to two-year project upon arrival and, well, time’s up. Adams looks very solid. LaCosse gets the #4 spot if they keep that many, but his main strength is the ability to catch the ball in traffic. Even with that in mind, he won’t be able to get on the field unless guys start getting hurt. Tye had his shot in 2016 to show what he could and he is competing hard here at camp, but I just don’t see how he can make it above the other guys. DT Corbin Bryant appeared to be in a ton of pain and was down for awhile with an elbow injury. It may be tough for the offense to play at a high level day in, day out when their opponent can rightfully be considered one of the best in the league. That is where I am labeling NYG at this point. The impact of DT Damon Harrison won’t be recognized by the casual fan that simply follows the ball when they watch. But make no mistake, like I said in mid-July, he is the most important player on this defense. DTs Jay Bromley and Dalvin Tomlinson will benefit greatly from playing next to him. Good to see DT Robert Thomas back out there, getting off the ball well and winning most of his one on one fights. He dominated OC Brett Jones on a couple of occasions. DE Jason Pierre-Paul looks like he can do what he wants, when he wants when TEs and FBs try to block him. His reach is so long and powerful, he made FB Shane Smith look like a little kid on one play. Keeping him at bay, then tossing him aside to make a run stop. S Eric Pinkins, whom I have discussed a few times, has a shot at making this team as a special teamer. His safety skill set, however, is still on the uphill climb as he simply doesn’t react well or forecast routes. The backup defensive backs were struggling to be on the same page today. CB DaShaun Amos, S Nat Berhe, and S Andrew Adams in particular. If there is one spot I am most unsure about, it is the spot next to Landon Collins. With how close he plays to the line of scrimmage and how often he is playing down hill, that spot needs to be locked up and reliable. Very curious to see how this LB group shakes out. Keenan Robinson and Mark Herzlich are locks to make this team, so I think just one out of Deontae Skinner, Calvin Munson, and Curtis Grant are going to make it. Munson probably offers more upside based on his instincts and aggression, but Skinner and Grant are much more physical. Grant had a very solid day. FB Shane Smith: Not only did he make a couple of solid lane-clearing blocks, he caught a couple balls in team drills and even got a red zone carry. Having a fullback behind Manning that can make the occasional play, especially as a rusher, gives the defense something extra to account for. If they don’t keep the FB and opt for TEs filling that role, it pretty much takes away that rushing possibility. Smith is a very good athlete and it is starting to show as he gets more secure with his assignments. DE Olivier Vernon: I guess it’s not very fair to discuss Flowers’ rough day without giving props to Vernon. OV looks so far developed and after a year of being here with these coaches and surroundings, I think we can plan on a big year from him. He makes himself so low and hard to grab with immense power and quickness. I think he is in line for a big year. WR Jerome Lane: It looks like these bottom-of-the-roster WRs have no shot at making this team unless an injury occurs. However, with the value this coaching staff has on Special Teams and knowing Lane has recent linebacker experience, he could be a surprise make. In addition, Lane has been catching everything in traffic. He is the biggest, strongest WR on the team outside of Brandon Marshall. In 1-on-1 drills, WR Odell Beckham, Jr. made a one-handed catch for a touchdown over CB Janoris Jenkins. Beckham later made a diving, finger-tip grab of a pass from Manning over Jenkins. Place kicker Aldrick Rosas went 3-for-4 on field goal attempts. TE Evan Engram dropped a low pass over the middle from QB Eli Manning. The Giants have been lining up WR Odell Beckham in the backfield quite a bit this summer. On one play, CB Eli Apple did a nice job of staying with him after a double-move coming out of the backfield. CB Valentino Blake broke up a QB Josh Johnson pass intended for TE Evan Engram. RB Wayne Gallman dropped a check-down pass. WR Keeon Johnson dropped a pass over the middle. Josh Johnson was the #2 quarterback during practice. Orleans Darkwa received a few first-team reps at running back. CB Michael Hunter jumped a QB Josh Johnson slant pass to WR Keeon Johnson, but dropped the pick. QB Eli Manning hit TE Evan Engram in the corner of the end zone for a touchdown against S Landon Collins. Curtis Grant received some first-team reps at linebacker in place of Devon Kennard (who was limited). Tight end Jerell Adams dropped a short pass. Running back Paul Perkins dropped a short pass over the middle. QB Eli Manning found WR Brandon Marshall over the middle for a touchdown. Marshall later beat CB Dominique Rodgers-Cromartie for another score. In a 3-TE set, QB Eli Manning hit TE Will Tye over the middle for a touchdown during 7-on-7 drills. WR Dwayne Harris made a leaping TD catch on a pass from QB Josh Johnson against a busted coverage. WR Keeon Johnson scored a touchdown on a pass from QB Geno Smith against a busted coverage. Smith then found TE Will Tye for a touchdown on a fade pass. He also hit WR Andrew Turzelli in the end zone. Offensive tackles Ereck Flowers and Bobby Hart were flagged with false starts. In 11-on-11 drills, WR Brandon Marshall beat S Darian Thompson, but he couldn’t come down with a high QB Eli Manning pass. FB Shane Smith scored on a goal-line rushing effort. Calvin Munson received some first-team reps at linebacker. The transcript of Ben McAdoo’s press conference on Monday is available in The Corner Forum while the video is available at Giants.com. The fourteenth and final training camp practice will be held on Tuesday, starting at 10:55AM. But this practice is CLOSED to the public. The players are off on Wednesday before returning to practice on Thursday. With New York Giants training camp beginning in late July, BigBlueInteractive.com (BBI) breaks down each of the team’s positional groups until the players report at Quest Diagnostics Training Center. 2016 YEAR IN REVIEW: Not good. The West Coast Offense, particularly the Green Bay Packers version that Ben McAdoo brought to the New York Giants, is heavily dependent on the performance of the tight ends. Entering the 2016 training camp, pundits and fans outside of the organization worried that the Giants had not invested enough serious resources to address the position. Both leading candidates to start (Larry Donnell and Will Tye) were former undrafted rookie free agents. The position was not addressed in the 2016 Draft until the 6th round (Jerell Adams). The other two prospects in the picture were also undrafted free agents (Matt LaCosse and Ryan Malleck). Based on 2016 results, those pundits and fans were right to be concerned. The poor performance of the tight ends was a major factor in the team’s offensive decline, from 8th in the NFL in 2015 to 25th in 2016. Run blocking by the tight ends was sub-par. And any pass-receiving tight end should have feasted on opposing defenses that double-teamed wide receiver Odell Beckham, Jr. and had to address slot receiver Sterling Shepard. Larry Donnell was the starter before the bye, but he only averaged 2.5 catches per game and finished the year with an embarrassing total of 92 yards and one touchdown. Donnell was benched after the bye with Will Tye becoming the new starter. Tye was better, but not by much. In his 10 starts (one before the bye), Tye averaged just 3.2 catches per game and also finished the season with just one touchdown. Factoring in rookie Jerell Adam’s lone score, Giants tight ends scored just THREE touchdowns all year. No wonder this team had issues in the red zone. This may have been the worst group of tight ends in the NFL in 2016. ADDITIONS/SUBTRACTIONS: Fortunately, the Giants made dramatic moves in this area. The Giants chose not to re-sign unrestricted free agent Larry Donnell. The team then signed Rhett Ellison to a 4-year, $18 million contract. The final big move was drafting TE/WR hybrid Evan Engram in the 1st-round of the 2017 NFL Draft. In addition, the team did re-sign exclusive rights free agents Will Tye and Matt LaCosse and added rookie free agent Colin Thompson after the draft. TRAINING CAMP STORY LINES: The obvious focus will be on 1st-round pick Evan Engram and how the coaching staff plans to employ the hybrid. 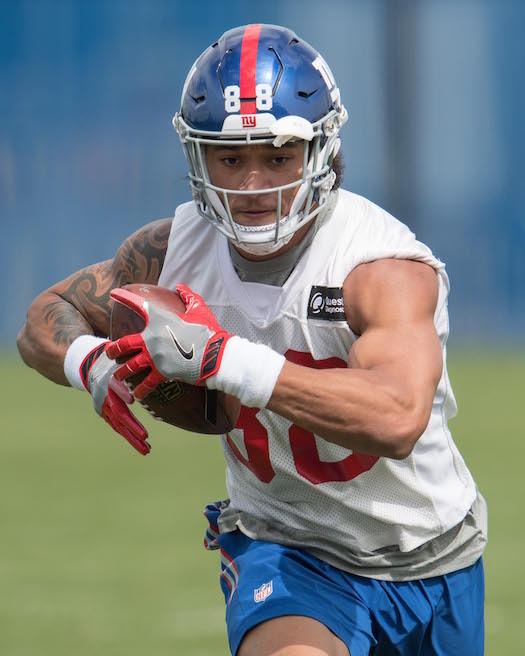 It is hoped and expected that Engram will be a Cover-2 buster and help open the entire offense for the receivers, particularly Odell Beckham, Jr. Rhett Ellison will probably have the similar, unsexy role he had in Minnesota and that is of versatile (tight end/H-Back/fullback) blocker who occasionally catches a pass. First, he has to prove he has moved past a nagging calf injury that sidelined him the entire spring. Jerell Adams has the size/athletic ability to become a quality two-way tight end, but he has to show he can mentally handle the pro game. With one former starter (Larry Donnell) already gone and still unemployed, the other 2016 starter (Will Tye) will have to fight just to make the team. One of the interesting things to watch is how often the Giants now move away from the 11-personel (one running back, one tight end, three wide receivers) that they used almost exclusively in 2016. And when they move away from it, how much will that cut into the playing time of a player like Sterling Shepard? ON THE BUBBLE: Evan Engram and Rhett Ellison are safe. One would think Jerell Adams is still very much in the picture given his potential, but he is no sure bet. Everyone else is on the bubble, specifically, Will Tye, Matt LaCosse, and Colin Thompson. PREDICTIONS: There were a lot of reasons why the Giants offense was so bad in 2016. Many have focused on the blocking of the offensive line. Others correctly point out that former skill position STARTERS were readily cast aside this offseason (running back Rashad Jennings and wide receiver Victor Cruz). But a major sore spot both in the blocking and pass-receiving departments was the play of Larry Donnell (now also gone) and Will Tye (fighting for his NFL future). On paper, the Giants are vastly improved at tight end. Evan Engram could develop into one of the NFL’s best pass-catching tight ends. Rhett Ellison is one of the NFL’s better run blocking tight ends. Jerell Adams – who has two-way skills – will be entering his second season. Matt LaCosse was consistently making plays during spring practices. If the Giants get the tight end position fixed, the entire offense will benefit, including the running game as perimeter blocking hopefully will be much improved. And when Eli Manning drops back to throw, coverage should be looser on Odell Beckham, Jr., Brandon Marshall, and Sterling Shepard. On paper, this is a very dangerous (albeit finesse) offense. FINAL DEPTH CHART: Evan Engram, Rhett Ellison, Jerell Adams, and Matt LaCosse. 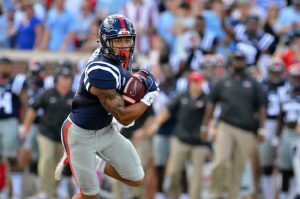 SCOUTING REPORT: Engram was a four-year starter at the University of Mississippi. He’s not built like a traditional tight end, more like an H-Back/wide receiver ‘tweener. The strength of Engram’s game is catching the football. He creates mismatches because of his combination of size and athletic ability. Engram is quick and fast. He runs good routes and is a natural pass receiver with a good catch radius. Engram is a vertical threat down the seam of a defense. He also runs well after the catch. Engram is committed to the game and a hard worker. While Engram works hard at his blocking, he lacks the frame to ever be a significant factor as an in-line blocking tight end. Reese: Evan Engram, tight end, H-back, Ole Miss. We think that this guy can be a dynamic weapon in our offense. Obviously he has great speed for the position – we think that he can be a matchup nightmare for teams trying to cover him with linebackers and safeties, so he was a guy that we liked a lot. Our coaches liked him a lot and it seems like they can use him in our offense in a lot of different ways and we think that with this addition as a fast receiver down the middle along with some of the other receivers we have, that we can help the offense out some. I will take any questions. Q: Did you try and trade up for O.J. Howard? Q: Did you try and trade up for anybody? A: I am not going to talk about – do you want to talk about our pick or not? We are not talking about who we tried to trade up for. Q: Did you value his big play ability over a tight end that was maybe more well-rounded as a blocker? A: I don’t think that any of the tight ends block that great in this draft. Most tight ends in these receiving offenses in college these days are not true to what we call, wide, wide type receivers, end of the line guys. Most of these guys are H-back types and we think that he is a tough, hardnosed, H-back type blocker, yeah. A: Well, we see him as a weapon. You guys can talk to our coaches. I think Ben will come in here and see you guys a little bit later, but we see him as a weapon and we will take all of the weapons that we can get. Q: How do you make sense of his skillset when he doesn’t have the blocking aspect? A: Like I just said, I think that the tight ends that come out of the offenses nowadays, these college offenses, these guys are more H-back type players. He is not a traditional end of the line tight end, but we think that he can do things in the blocking game. He is big, he is fast, he has big hands, he is smart, he will help you on special teams – he is a well-rounded, versatile football player. Q: You added Brandon Marshall. This guy is similar in size, right? A: I don’t think Brandon is – what does Brandon weigh? Brandon is a big man, I can tell you that. But this guy, we are calling him a tight end. You guys can call him an H-back, call him whatever you want to call him. Q: Do you see him as a guy that is going to be in the slot? A: You guys can talk to Ben about that. We see him as a guy that can line up anywhere at any of the receiver positions, tight end, in the slot, outside – he can line up anywhere. Q: How do you think the first round played out? A: Well, it played out just like most first rounds. This draft was a little different because we thought that guys would come off of the board all over the place and it did that. There were a lot of uncertainties about a lot of players with respect to some off the field issues, some injury issues, different issues like most drafts have, but I don’t think that anyone was surprised about anything that happened. Q: In the media and mock drafts, Engram was a guy that people saw as a second rounder or late first. What do you think was the difference between what you guys saw in him compared to the mock drafts? A: Well, we liked him because, again, we feel like he is a weapon in the offense. We think that this guy can be a weapon and he is versatile and you can use him in a lot of different ways and our coaches are extremely excited about getting a guy like this in our offense. Q: Reuben Foster was on the board. Is that a guy that you didn’t target because of his off the field issues? A: Well, we had (Engram) in a good spot and we picked him and I am not at liberty to talk about what we have working right now. (Foster) is still on the board. Q: With the receivers that you have, does that help your offensive linemen because you have quick guys that can get open faster? A: We hope so. We hope that everyone we pick can help our offense in some kind of way, so we feel that this guy can come in and again, you play two-high safety in this league and if you have a guy who can stretch the defense down the middle, we think that is a tremendous weapon for the offense. Q: You struggled to score points last year. How important was it to get an offensive weapon in this draft early on? A: Yeah, we are just trying to help the offense any way we can and help our team anyway we can, so that is important for us, just to get a good football player and we think that we got a tremendous football player. Q: Was this just not a year that you felt an offensive lineman in the first round was going to work? A: There are some offensive linemen that we think are good football players, but we stay true to our board and we picked the best player that was up there. Q: How do you think that Evan Engram fits in with your current set of tight ends? A: That is a good question for Coach McAdoo. We think that he is just a dynamic football player who will help our team. You guys can talk to Coach McAdoo about how they plan on using him, but he has a skillset that you can use him in a lot of different ways and I am sure that coaches will be creative in using him that way. Q: Do you think he is a guy that will open up the red zone? A: I think that he opens up a lot of things. We just feel like – Jordan Reed is a good example of a tight end that is hard to handle, one of those undersized tight ends that is hard to handle for linebackers and safeties and this guy is probably cut in that same kind of cloth and this guy is really fast. This is a fast, receiving tight end. Q: You mentioned the two-high safety look as something that you struggled against last year. Is this pick kind of a response to that? A: Again, we think he will help us. That is for sure. We think that if you can stretch that two-high safety look with speed down the middle and you have speed on the outside, I think that helps us. Q: Was he your top tight end on your board? Q: The way you guys viewed him, was it a situation where you walked in this morning and you thought there would be a pretty good chance that Engram would end up being your guy? A: We talk about a lot of different scenarios, a lot of different players being in position to take at 23 and he was one of those guys. Q: Very few tight ends combine blocking and receiving, how do you differentiate between guys who are primarily pass catchers at that position? What separates one ahead of another? A: Well you have to see their skillset, their speed, their hands, their body control, their routes, their feel for the game, so those are the things you look for in a receiving tight end. Evan lines up a bunch of different places; they used him a lot of different ways, so he just seems to have a natural feel as a receiving tight end. Q: The size and speed of tight ends these days is a lot different from what it used to be, does this go along with what the Giants’ plan for what the offense will be? A: You have to ask Ben (McAdoo) about if he’s a part of the plan, but from a scouting prospective he was a playmaker. He was a versatile playmaker, very athletic guy, clean off the field, and checked all the boxes as far as things we look for in a quality player. Q: If you look at his numbers, he had a big jump last season. Anything happen? A: I think they just used him more in the offense. He was a senior, you rarely see seniors anymore, he just grew as a player, he got better, they used him more and I think they both benefited, Ole Miss and Evan. Q: David Njoku was another tight end that was on the board at the same time, what differentiated the two in your opinion? A: I won’t talk about Njoku versus what we liked about Evan. What we liked about Evan was his versatility, his feel for the game, his polish, his hands, his route running and his experience. Those were the things that we really liked about him. Q: Was part of it adding another game breaker, home run hitter type to compliment Odell [Beckham Jr.] and to just give you more explosiveness that way? A: Anytime you can get somebody who can make first downs and score touchdowns, that helps out the offense. It helps everybody out. The coaches are really excited to add a guy like this. The more weapons you have, the harder you are to defend, and hopefully it will come to fruition like that. Q: He’s called a tight end. The way football is played now, is he more of a weapon than tight end? A: He’s not going to line up on the line and just try to drive block people all the time. He’s going to be in the backfield, he’s going to be in the slot, he’s going to be detached. He will be down at the traditional tight end position sometimes as well, but the way Ole Miss used him he could line up at four or five different positions. He has that versatility, he has the smarts to do that, so I would envision that we would use him in a similar fashion because that’s a benefit that he has. Q: Do you see any Jordan Reed in him, Jerry Reese mentioned him. A: You can see the similarities, he’s an inch taller, Jordan was 10 pounds heavier, this guy ran a lot faster, but the way they were used, yes, very similar. Q: Did you time him yourself? A: Evan? No, I let my scouts do it. I just write it down and chart it. I’m too old for that. Q: Is his speed comparable to some receivers? A: Yes, besides John Ross, he was one of the fastest guys as far as a receiver or tight end. He might have been the second fastest guy. The receivers that were taken in the top ten, one (Corey Davis) didn’t work out and he ran faster than the other one (Mike Williams). He was about the second fastest guy as far as the skill positions on offense. Q: Spags calls it basketball on grass sometimes, do you guys in the personnel department look at the tight end position maybe a little bit differently now? Do you have to do that because of the way the game is played? A: Yeah, you just don’t see it anymore, traditional tight ends in college. It’s rare to actually see a guy line up and do that. The way the game is played in college, it’s spread out and they’re catching the ball and just chucking it around sometimes. I think we’ll see more and more of these guys if they have the athletic ability, the feel, the smarts, all that stuff that you do. Q: Do you find is unusual to see two or three tight ends taken in the 1st round? A: No, nothing surprises me. Going through the process, you knew who the good players were and you had a good idea of where they were going to go, so it didn’t surprise me. Q: You signed Rhett Ellison before this, is that a good complement? First a guy who can block and now this a guy…? A: Seems to be. In theory, yes, it looks like that. Hopefully it plays out that way. Q: Did his 40 time open your eyes even more than they had been with him? A: Yeah, he was fast, but nobody expects the guy to run 4.42 at that size. You just never would’ve thought that. You think the guy would run a 4.5, 4.6, or something like that, but for a guy to jump out there and run a 4.42, it was shocking. It didn’t push him up on the board anymore, it didn’t change the perspective, the reports were in with what he could do with his skillset and that just added another positive value to his profile. Q: Can he line up on the edge and drive guys, like a traditional tight end? Q: What was your impression with the way the first round played out in general? A: You go in the draft and you always expect the unexpected and right from the start, there were some unexpected things that happened and you don’t know what it is but you just wait for it to happen and it did. 32 draft boards, 32 teams, they got it all different. Q: The offensive line crop was historically shallow based on the number of players picked in the first round, did that kind of match up with your evaluation of that class coming into the draft? A: We had some guys we liked, we had some guys we didn’t like and we’ll see. Q: Not to hammer home the Jordan Reed thing, but when you have a player and you go against a player and you see how difficult it is to defend against that profile, does that add…? A: You always draw comparisons when you play a guy. DeSean Jackson leaves Philadelphia and goes to Washington, aww man, come on. So, of course, when you play against a guy twice a year, it’s more on your mind, but you don’t look and say we need to get that kind of guy. It’s just when you’re talking about the process, you bring up the comparison. McAdoo: Excited to add Evan Engram to the mix. Talented player out of Ole Miss. Length, speed, playmaker, special teams contributor. We’re excited to add him to the mix and hit the ground running with him. Q: He has drawn comparisons to Jordan Reed, a big tight end/receiver type. Do you envision him to be that kind of player that can play multiple positions within the offense? A: Yes. He played multiple positions at Ole Miss. I think we can bring him up and move him around a little bit. He needs to play special teams out of the gate and move him into our offense to see what he can handle. Push him that way. Q: Where do you think he is as a blocker? A: I think he’s a willing striker. We need to refine his fundamentals. He does what he’s asked to do in their offense and does it well at a high level. We have some things that we’re going to have to work on with him. Q: Does he have that competitive nature? A: Yes, he’s a competitor. Q: Is he more of a slot weapon to you as opposed to a guy that’s going to be in line with bodies? A: Again, we’ll get him here and play with him in a variety of ways but he’ll play with his hand on the ground. Q: Because of that flexibility, what does that do for you as a play caller? A: The fastest way to the end zone is down the middle of the field. Anytime you can add someone to your offense that can run down the middle of the field with that type of speed and length, it stresses the defense. Q: The consensus was that the top TE in the draft went a few picks before you. Was there any thought in your mind to try and push to go get him? A: I’m not going to talk about any of those strategies. Q: Do you feel that Engram can make an impact in the run game? Q: How much contact, if any, did you have with him during the pre-draft process? Q: How surprised were you entering today that this is the way it turned out? A: Nothing surprises you. You just go in and take it one pick at a time. See who’s on the board, a top guy on the board. You have to be confident. It’s all about doing the work going into the process. Trusting what you do, trusting your work, trusting the group, trusting the room. Q: Did you like that Foster was there? Were there two or three guys you were looking at that were still available. A: I think there were a lot of good players still left on the board. Q: Does Engram have good yards after catch ability? A: I think he’s a threat after the catch, yes. Q: Did you see him as the best player available there or was he the best player for the need? A: I saw him as the best available player. Q: How much did you look at him before the draft? A: I spent a lot of time on him. Just like a lot of scouts, other coaches and personnel people. I spent a lot of time. Q: What was it that stuck out to you when watching him? A: I think he’s a guy that’s played multiple positions. He has special teams versatility. He has some snap to him, snap to his body as a blocker. He’s willing as a blocker. Again, the speed just jumps off the tape. The yards after a catch just jumps off the tape at you. Q: How does he fit in with the current set of tight ends you have now? A: We’re going to put him in the room, teach him the offense and get on down the road. Again, we’re just adding another player to the mix. A good player that has a lot of potential. Q: In going to Ole Miss, does he know Eli? A: That’s a better question for Eli. Q: With the addition of him, Marshall and Ellison, how much versatility does that give you going into next season? A: We’re very happy with the players we’ve added to the tight end room and very happy with the players we have in the tight end room. It does give us some versatility and some flexibility. We need to get them all together. We haven’t hit the field yet; we need to hit the field. Q: How does it feel? A: I can’t put it into words. Honestly, I dreamed of playing for a couple of teams. I had it in my mind and New York was at the top. This is an amazing feeling. I’m so blessed. I can’t even find the words to describe it. I’m just very thankful and blessed to be a part of just this night. I have my family and friends. It’s a real blessing. I feel really blessed. Q: Were you surprised when you got the call from the Giants? A: I sat here and I saw it was Miami the pick before and New York just a little bit above it. I was just like, alright let’s see, Miami could call and New York could call. As soon as the Miami pick went in, I got the call. I saw the city under the number and I knew it. I wasn’t expecting it. I felt that it was coming but it was just, I was kind of surprised by it but I felt it in my dreams. Q: Do you feel you are ready to come in and make an immediate impact? A: I know I’m ready to come in and make an immediate impact. I know for a fact. I’ve been watching the Giants, they’re on TV all the time. I sit down and watch them, especially this past year. I’ve been really analyzing teams and certain offenses. The Giants have been missing a piece like me. They have a great quarterback and I think Tye, 45, was great for them. I felt that I could be another more dynamic piece at that role. I just always felt that they would look at a guy like me to come in and contribute. I know my skillset. I’m confident in my game and how hard I work. Just the weapons around me, I can’t wait to come in and contribute. Learn from all those guys and take advantage of the opportunity to be a great player for this team. Q: Being a fellow Ole Miss alum, has Eli Manning reached out to you before or after this process? A: No, I haven’t talked to him before. He texted me after they announced it and everything. He told me to enjoy the moment and that he’s looking forward to getting to work with me. I just told him thank you. He said he’ll be in contact to catch up in a couple of days. He hit me up after the pick went in. Q: Have you ever met him? A: Yes. He’s always around Ole Miss in the offseason. There’s been a couple of times I’ve caught a couple of balls for him. Just servicing him and running some routes that he needed. It kind of manifested in those moments I guess, this moment right here. I can’t wait to play with him, learn from him and just be a great player for this team. Q: All along did you expect to be a first-round pick? A: I knew I deserved to be and I knew I should be. It’s just what I bring to the table. I’m so dynamic and so confident in myself. I’m not trying to be cocky or anything because that’s 100 percent not it. I’m just really confident in what I can bring to a team. I definitely believe that I should’ve gotten a call in the first round and that someone was getting one of the most dynamic players and best players in the draft. I knew that I should be and I was just praying that I was. I came back for my senior year and that was one of my goals to solidify a first round pick. God has led me through all of this and to hear that tonight with the New York Giants, I knew that it was going to happen, I knew it should happen and I’m blessed that it did. Q: Do you feel you can be effective in the slot or at wide receiver? A: Yes. I feel like I can be a threat anywhere. I definitely have a lot to learn. Being out wide, I didn’t do it as much in college so I’m definitely ready to learn more about that, but in the slot, attached, in the backfield I feel like I can be a threat anywhere. I can’t wait to just get in there, learn, work and earn my way up into the offense and into making plays. Yes, I know I think I can be a threat anywhere around the ball. Q: Do you create mismatch problems for the defense? A: Yes, I guess from a coach’s standpoint, they love to move me around to make those mismatches. I know that my coaches at Ole Miss did and I kind of get excited when I see some big linebacker that is trying to man me up or some big safeties with bad hips – I just get excited when I see those guys trying to man me up. I do feel like I am a mismatch problem and I guess I am a huge plus for an offensive coordinator to have. Q: You played in the SEC, which is regarded by many as the best conference in the country. How do you think playing in the conference prepared you for the NFL? A: Man, look at the numbers that the SEC puts into the league. We are playing the best players in the country every week and just game planning for that, practicing for that and competing with that, it definitely helps us translate to the NFL. Just look at the numbers and it proves it. So just playing the likes of LSU and the Bama’s and the Arkansas’ and Auburn’s and Georgia’s and there are just so many athletes and so many talents make their way to the league from those schools – it definitely gives me an advantage going into the league and playing some more against some of the best athletes in the world. Q: Where are you right now and who are you watching the draft with? A: I am in my hometown, Powder Springs, Georgia, with all of my best friends, my family, people who have helped me get to this point, and it was tough because I got invited to the draft and I was torn because I wasn’t sure if I was going first round and that was the only way I wanted to go, so I decided to stay home. I couldn’t be more excited just being around my people and where everything started, it is just a huge moment. If I could do it all over again, I wouldn’t change one thing. Q: You have gotten some comparisons to Jordan Reed of Washington. How does that make you feel? A: I have been looking up to him for so long. He was such a huge talent at Florida that I didn’t think got used enough, so when he got to Washington and got used to his abilities, he has been doing such great things in the league. So just watching him and studying him and I would love to work with him some day because he is such a threat, so savvy with his routes and so precise and he gets physical after the catch. Being compared to that is what I want. I want to be better than him, but that is going to be a tough task. But being compared to him and being able to bring to the table what he does for a team like the Giants is a blessing. Q: How much contact did you have with the Giants during the pre-draft process? A: Honestly, not that much. I talked to them at the Senior Bowl briefly; I talked with them at the Combine. I didn’t have any visits with them; no workouts and it just really came out of nowhere. I kind of felt myself being a threat there and being a possibility there, but it really came out of nowhere. I didn’t talk to them as much, but I kind of felt that they had their eye on me, so I guess it worked out. SCOUTING REPORT: Fifth-year senior. Tomlinson is an average-sized tackle who is very strong and tough. He can hold the point-of-attack against the double-team block. He is an outstanding run defender who plays with with leverage. Can stack and shed and he is a sure tackler. Tomlinson is not a top-notch pass rusher, but he has good quickness and can push the pocket. Tomlinson is very smart and a high-character player who plays hard all of the time. Tore one ACL in 2011 and the other in 2013. Reese: Dalvin Tomlinson, defensive tackle, University of Alabama. Big guy that we think can come in and compete for a starting job for us. Create a lot of competition at that position. He’s a two-gap type player. He can hold the point of attack, has that NFL toughness that we like and the profile that we like. We thought he was a terrific pick right here right now at this point in the draft. Q: Did this position become more of a need when Johnathan Hankins left in free agency? A: Well, we’re just trying to pick good players. Obviously Hank left, so that created a little bit of a void. We’re just trying to pick good players. We stayed true to our board and he was the next man in line. Q: Does the way that Landon Collins has worked out so far make you even more comfortable taking a guy from Alabama? A: Well, Alabama has notoriously put out good players and Landon is a terrific player for us. We’re just trying to pick good players from wherever. Alabama has obviously been a top program. This guy is, like I said, NFL ready. He’s a big, tough guy. Big guy on the inside. Q: How much have you interacted with him? A: We interviewed him at the combine. He was one of the best interviews we thought out of the entire combine. He was one of the best guys we interviewed. He’s a New York Giant kind of player. Q: What was so impressive about that? Q: Is he a guy that can bounce outside to defensive end as well? A: No. He’s an inside player. He’s a two-gapper and can push the pocket inside. He’s an inside player. Q: Was he close to being a first round pick? A: I think some guys probably would’ve considered him as a first round pick. I think that, yes. Q: You seem very comfortable with this format. Every three or four years you take a defensive lineman and get what you can out of him. Is that just the way it’s worked out? A: That’s just the way it’s worked out. We would love to keep the player. Sometimes you can and sometimes you can’t. With the last two big guys we’ve had inside (Linval Joseph and Johnathan Hankins), we weren’t able to keep them. They moved on to a better situation for them. We’ve been able to draft some guys that have been able to come in and fill the gap for us. Q: With an undergrad degree in finance, Dalvin is going for a second degree in financial planning in May. How proud does it make you that you guys have brought in someone smart both on the field and off the field? A: We want him to play football. We don’t want him to do our taxes or anything like that. We want him to come in, stop that run and push that pocket so our defensive ends can get to the quarterback. Q: You’re comfortable having two mainly run-stopping guys in the middle of the line? A: Well, we think he can push the pocket inside. He’s violent with his hands inside. He’s got that NFL toughness that we like. He has the grown man strength inside. We think he can push the pocket for us inside. Q: You like that though? The two guys that are run stuffers in the middle. Is that fair to say? A: You have to stop the run up here. You have to rush the passer and you have to stop the run. I think he gives us a two-way guy. Q: The one thing that sticks out in his bio is the two ACL’s. How much did you have to push him just to make sure? A: Yes, that came into consideration for us. He’s played on those things for three years now. Our trainers and doctors were okay with him and didn’t think it would be an issue. Q: Is this a guy that you guys feel can step right in and contribute? A: For sure. It kind of reminded us – we kind of talked about the situation where when we had Linval (Joseph), the year we took him we kind of talked about him early and then he was there in the second for us and filled a void. Linval goes and then (Jonathan Hankins), we were really high on Hank and we talked about him early and he was there in the second round and we took Hank and he filled in. Both of those guys became pretty good players for us, so this was kind of a similar situation. Q: So in four years you will be looking to replace him? Q: Is there a guy that you can compare him to that is in the pros now? A: No, he is himself. I don’t know. I am not that smart to kind of go off the top of my head. No, nobody jumps off right now. Q: What about Hank? How similar or different is he to Tomlinson? A: They are different players. I will just talk about Dalvin. Dalvin is strong, he is country strong, he has jolt, he has walk-back power, he is stout at the point of attack, he has sneaky athleticism and every down he plays hard. Every down. Q: Was the knee injury a concern? A: No, he has been three years and played and we have a great medical staff here that makes sure that we don’t take anybody that is a risk and they were good with him. Q: What do you remember about the combine interview with him? A: Man, Dalvin was one of the best definitely this year, but he will be a guy that you talk about for a long time. He was one of the more memorable ones that we have had. He was just smart, mature, poised, confident, just a man. He walked in the room and he had a commanding presence and as they say at Alabama, he is a man’s man. He was an ultimate leader there, guy you want in the foxhole and just really a leader for those guys. We hope that he brings some of those same attributes for us. Q: Did all of that come through in the interview? A: Yeah, well you knew about it coming in because all of our scouts do a great job throughout the year getting the information, and everything from Bama right from the start was, ‘Watch out for this guy, he is underrated. They have all these stars on the defense, but watch out for this guy.’ Sure enough, the guy is kind of the lynch pin of their defense and they are underrated, so you knew all of the positive things that they say and then when he comes in the room and talks – you will see when he gets here. The guy is pretty impressive. Q: Was there one thing that he said that really stuck with you guys? A: No, just the whole interview and the way he carried it to just talking about his life and then all the football things that we talked about. Q: When you walk out of an interview like that, do you kind of think that you would love to make that pick at some point? A: Yeah, you want all the boxes to check positive. I would say convergent validity from your scouts, from your interview, from the combine, from the fall and everything to kind of come together and he was one of the few guys that when we talked about him, it was all positive, from the area scouts, to the coaches, to myself, to Jerry (Reese), to Ben (McAdoo) and Chris Mara. Everyone said positive things. Now, did that mean he was the first pick in the draft? No. But I just mean that everything that we talked about Dalvin was positive with his profile. It was just one of the more impressive profiles on and off the field that you will see. It is what we like to call a clean profile. Q: His NFL.com profile stated that he never played more than 45 percent of snaps in the season. Is that something that you look at? A: I never knew that stat. I just know that at Alabama they rotate all of their guys in and out and they play. We just know that when he is in there and he is playing whatever role for us, but for them when he was in there he was doing the dirty work, getting the hidden production and just a grunt, tough guy in there. Q: How important was it to bring in someone from Alabama who has that championship experience and was working under one of the best college coaches of all-time? A: That is always a positive. Bama puts out good players. You are looking at 15 guys every year at Bama and you know that they get big-time recruits and that they have the pedigree and the profile, so when you are going there you have an expectation of what you are getting from players from that program. Q: He has a pretty substantial wrestling background. Is that something that you look for in a defensive lineman? A: If he can wrestle the offensive lineman down and make a tackle, yeah. But no, that just adds to his impressive profile, that the guy was a three-time state champion in wrestling. Q: You mentioned last night that Engram was a clean profile guy. Does that factor into where you place players on your board? A: Sure. Experience, positive off the field profile, those are the things that help out a player’s value on our draft board. Q: Dalvin’s parents passed away. Was he raised by relatives? A: Yeah, he had a group of people that kind of raised him. The things that he has been through in his life – he had to grow up fast and it shows in the way that he carries himself. Q: You have been at Alabama every year. Is Tomlinson the kind of kid that you had an eye on the last couple of years? A: No, he is a fifth year senior and kind of had to work his way up into the system there, so he wasn’t one of those ‘jump off the screen’ kind of guys when he was a young guy. They rotate so many guys in and out of there that you don’t know who is going to be the next one. But he earned his time on the field and he made the most of it. Q: How important is it that he has that dirty production aspect? A: I think that is a big thing that the coaches were looking for with whoever that fourth guy was in there because we have three studs on the defensive line, I think. So the next guy – he can kind of come in there and learn from those guys and play his role, there are not a lot of big expectations and just go play. McAdoo: Very good profile, pro ready, excited. I’ll open it up. Q: Jerry said it was a pretty memorable interview at the combine. A: Yes, he did a nice job in the interview. He knew the football very well, great personality, he’ll fit in well in the room. Q: Is that a thing where you test him on plays or something like that? A: Yes, we have some different things we like to take them through, different exercises and he did a nice job. Q: When you consider bringing guys into the defensive line room, do you think about the big personalities, big players when you look at that defensive line with a guy who can really fit in with a OV (Olivier Vernon), JPP (Jason Pierre-Paul)? A: I think the interview just kind of confirms some things. You see him on tape, (he) plays at a high level, he’s pro-ready, plays with a good pace, uses his hands very well, which is something you don’t get with a lot of guys coming out of college and do it very well. He’s not just a run stopper, he has some transition rush skills, which is nice on first and second down. He has some versatility there to. Q: Not everybody does, but how much do you like having the two 300-plus pounders together in the middle that can both stop the run and how beneficial do you view that combo together? A: I like third and long. That’s a good place to start, with your defensive tackles. Q: Do you draft a guy like Tomlinson thinking about the fact that you play a team like Dallas in your division twice a year that’s going to be running the ball for a while? A: Just value in big guys. It’s where he was on the board, but you have to stop the run. That’s the foundation in this game. One of the core parts of this game is stopping the run, getting teams into third down and long so you can rush the passer and disrupt the quarterback. Q: How do you view this move as the Johnathan Hankins replacement? A: We lost a good player, Hank moved on. Dalvin was at the top of the board, so we picked him. Q: Is it difficult to evaluate a guy like him when he has so many good players around him? A: You just watch his fundamentals; grade him off of his fundamentals. They produce some good players down there at Alabama, but they play good players as well. You see good players throughout the SEC, so he’s battle-tested. Q: How similar or different is his skill-set from a guy like Hankins? A: They’re two different players. He has some versatility, he can play a little nose, a little three (technique), possibly some five technique or some four technique based on the scheme. Q: Coach, two picks so far, two players from the SEC, what does it say about that conference that you guys have gone there twice now? A: They must have some good players because they were at the top of the board twice. Q: What was your reaction when you got the call from the Giants? A: I was excited. My family was excited with me. Everyone was happy for the most part. Q: Was this about where you thought you would go for the most part? A: I wasn’t sure where I was going. I was just waiting and being patient, to be honest. Q: What do you remember most from your interview with the Giants at the combine? A: I remember just critiquing myself a lot. I told them about my life story and everything. I’ve been through a lot of adversity in my career at Alabama and also in high school. I always fought through it and just wanted to become one of the best competitors on the team. Q: Do you feel that you’re NFL ready? A: Yes, I feel like I’m ready for the NFL. Q: Dalvin, are you particularly excited to play with Landon Collins after the year he had and with a defense that led the Giants back to the playoffs last season? A: Yes, I’m super excited to see Landon again. The Giants defense is an amazing defense. I love the play calls and the scheme they run. I feel like I’m going to be a perfect fit for their defense. Q: Has Landon reached out to you? A: I’ve been getting a lot of texts and calls. I haven’t seen anything from Landon yet, but I’m pretty sure he has. Q: Can you just get us up to speed on your background? A: I grew up in Georgia. I was a three tournament wrestler. State championship in high school. Just have been through a lot of adversity. My mom passed going into my senior year. I pushed through it and it motivated me to become a better football player and person. I used that at Alabama and try to continue to get better each and every day. It paid off for me. Q: Your father had previously died? A: Yes, he passed when I was five years old. Q: Who are you gathered with right now that is closest to you? A: My brother, my aunts, uncles and cousins. Family friends and all the coaches from high school and even park ball that have been coaching me through my whole life. Q: Is part of that adversity going through two ACL surgeries? A: Yes, it is. Coming into college with a torn ACL and then also having a second one and still being able to get back onto the field. Most defensive linemen probably wouldn’t have been able to come back from it the way I did. Also, to fight through it each and every day was tough on me at first. I just kept fighting through it each and every day and it ended up working out in the long run. I’m grateful for it because everything happens for a reason. Q: How would you characterize your pass rushing skills? A: I feel like I’m a great pass rusher. I haven’t been in the position to show it off a lot. I feel like I’m an even greater run stopper but I have a very good pass rush game. Q: I think I read that you could’ve gone to Harvard. Was that right and a serious consideration? A: Yes, that’s right. I was pretty much considered a nerd coming out of high school. Harvard was in consideration for me because academics was a big thing in my life. Q: Were you a soccer goalie? A: I was a goalie and I played striker, also. Q: How many red cards did you pick up? A: I didn’t pick up any in a few years. I’m surprised just like you are. I thought I was going to get a lot more red cards. Q: You played soccer in high school? A: Yes, I played up to my senior year, right before I got to Alabama. Q: Soccer and football are in different seasons in Georgia, right? A: Yes. Soccer is in the spring and football is in the fall in Georgia. Q: At Alabama you wrestled teammates in the locker room all the time right? A: Yes, for the most part.Q: Undefeated? Q: How much are you looking forward to joining this defensive line here? They have a couple good players. A: I’m pretty excited. They can teach me a lot of things from the defensive line standpoint. I’m blessed to have people like that at the program already. Q: How familiar are you with that defensive line already and the fact that you’re the replacement of Hankins? A: I haven’t gotten to meet them personally but I’m pretty sure when we get there we’re going to have a pretty good relationship and build an even stronger brotherhood. They’re going to mentor me and become a better defensive line. SCOUTING REPORT: Webb has the tools. He has ideal size and a very strong arm. He can move around the pocket, but he is not a scrambler. Webb throws a nice deep ball and can wing it through tight windows. But he is a project who needs a lot of technique work and more experience in reading defenses given that he comes from collegiate spread offense. He can be streaky with his accuracy and his decision-making has been questioned despite his intelligence. Webb is a very smart, hard working quarterback who loves the game and who is dedicated to getting better. 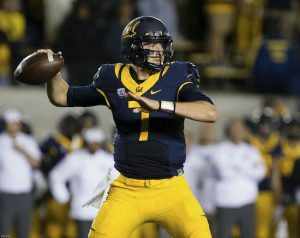 Reese: Davis Webb, quarterback, Cal. A third round selection. He was very productive in that offense, like a lot of quarterbacks are. We thought that he had the best arm in the draft this year, really a gifted arm, thrower. For a tall guy, he is a good athlete. He can be off schedule and buy some time with his legs, so there are a lot of things that we liked about him. We think that he will have time – like we said earlier, Eli has however much time that he has left, two or three years left in his contract or however long he plays. We think that this guy has a high ceiling that can come in here and develop behind him and learn the pro game and challenge and compete and create competition at the quarterback position. I will take any questions. Q: What are the challenges of using a high draft pick on a player that is probably not going to play for a couple of years? A: Well, you never know when a quarterback is going to help. Obviously, we would like for him to have a couple years to be the caddie and learn the pro game and all the nuances of playing quarterback in these league, but he has all of the tools to play the quarterback, and we think that he has a high ceiling and hopefully he can sit on the sideline, hold a clipboard and learn the game. Q: When you drafted Ryan Nassib, I think you said that you hope he never plays. Is it different with (Webb)? A: We hope that Eli continues to play at a high level and this guy can develop. That is what we hope for. You never know what is going to happen, but that is what we hope for. Q: Did you have a first round grade on Davis Webb? A: We had a good grade on him. I am not going to talk about which round we had him. We had a good grade on him. Q: How surprised were you that he was sitting there in the third round? A: I am not surprised by anything in the draft anymore. It is hard to surprise me in the draft. But we liked him, we had him rated high and we think that he has a top skillset to play this position in the National Football League. Q: Do you feel like you have an advantage in taking this guy and knowing that he has a chance to develop in the next couple of years? A: Well, we hope so. That is what the whole premise is – that this guy can sit behind Eli for a couple of years, two or three years or however long it takes. Let me get this straight guys, we hope that Eli plays for a long time for us. Eli is our quarterback and we still think that he can play at a high level, but we do know that he is not going to play forever, so we are trying to make the best decision as we move forward for the rest of Eli’s career. Q: What type of franchise quarterback qualities did you see in Davis Webb? A: Here is the thing. First of all, he has a big arm. He has one of those wintertime arms, he can throw it in the wind, so again, we thought that he had the best arm talent in the draft this year and this guy is football all the time. You have to be that kind of guy in this league. You can’t half do it up here and play at a high level in the National Football League. This guy is a son of a coach, football all of the time and he has the quarterback profile that we like. Q: What was the process like with him? Did you see him or meet him? A: We didn’t bring him in here or anything like that, but we spent some time with him at the combine. Q: Nobody went to work him out? Q: How does this work out for the rest of the roster? You have five quarterbacks now. A: Well, again, we are just going to create as much competition at every position as we can and that will take care of itself as we move towards training camp and we will see where it goes. Q: Did you sit with Eli at some point and let him know that you were thinking of bringing in a quarterback to develop? A: Eli understands the process. Eli is a very smart guy and he understands the process. He knows that he is not going to play forever. He knows that it is our job to prepare for when he has finished his career here, so he understands that. It is nothing that we had to talk to him about. Q: Did you talk to him after you drafted the quarterback? A: We didn’t have any conversation with Eli before we drafted, but we draft a quarterback and we are going to let our quarterback know that we are drafting a quarterback, of course. Q: Is there any concern that you are coming out of the draft without picking an offensive lineman? A: Well, there are a lot of picks left and we will keep trying to fix the roster and add to the roster as we move through the rest of the draft. We have more picks to take. Q: When you made the first few picks, did you have to talk about if you had to take Webb at that point? A: You never know where guys are going to go. We stay true to our board. The big defensive tackle was there and we picked him and this guy was the next guy on our board and we picked him. Q: What do you like about him? A: He’s a big guy with a live arm. Son of the coach with the top intangibles. Went to Cal and took leadership of the whole group. He ran meetings. Really strong personality, a leader. A football junkie. He’s a surprisingly good athlete for his size. Just has a lot of upside to develop. Q: What happened when he was at Texas Tech? A: He was coming off of a couple injuries. He started there. Texas Tech had a lot of guys that transferred out of there. A kid went to Virginia Tech, a kid that is at Oklahoma now. Davis kind of beat them out. He was competing against Mahomes. Coming off an injury, Mahomes had a leg up. He just kind of beat him out at that point. Q: Did you get to see him at his pro day? A: Yes. Saw him at the Senior Bowl, saw him at the Combine. We’ve been tracking him all year. Our area scouts were really excited about him early in the year because of the transfer and guys that are out west. Really fired up about him from that point on. Q: What does it say about his resiliency as a player that he could lose his job at a major program at Texas Tech and then go right to another one like Cal? A: This guy is a football player. Son of a coach, tough guy. Obviously disappointed. I’m sure he’s disappointed right now that he wasn’t a higher pick. That’s what you love in a quarterback. Guys that can bounce back and have fortitude to persevere. That’s what you need. We think he has that. Q: Is the process of picking a quarterback different than from other positions? A: It’s more of a lightning rod type of pick as opposed to picking a DT or corner and stuff like that. A quarterback has all these innuendos and questions about why you’re taking him and what you’re going to do with him. It’s the most important position in sports, so of course it’s going to get the most attention. Q: Did you have any contact besides the Senior Bowl and the Combine? A: Yes, we met with him in the fall, our area scout met with him. Senior Bowl, we met with him. Combine, we met with him. We kind of kept an eye on him. I’m surprised he was still around at this point. I thought he would go higher. Q: Why do you think he fell? A: That’s a good question. I think it was the system that he played in, a little bit of the inaccuracy that he had. Each team evaluates quarterbacks in a different way. Q: One of the scout criticisms was his deep ball can be a little inaccurate. Is that something that when you have a coach like McAdoo and a couple of years, you feel like you can work out? A: We’re hoping this guy can develop his skills. You have a guy like this in the situation we have now, we’re hoping he doesn’t have to come in right away and be the guy and get thrown into the fire. He can work on his skills. Q: Were some of those concerns on why he fell not as much of a concern to you guys? A: Yes. Obviously, it gives you a little bit of a cushion and some breathing room. You saw what happened in the first round, teams trading up everything to get those guys. We feel we have a fairly equal talent at the bottom of the third compared to some of the guys that went pretty high. Q: Ben McAdoo hasn’t even met Davis in person. You take that as he trusts the board and scouting. Does that speak to how this process played out? A: You learn from Philly down there. The Sixers. Trust the process. No, I think we work hand in hand really well together. The coaching staff, scouting staff and ownership. Frankly, I try and put Ben in touch with guys that I think we really have a chance to get. Again, I did not think at this point Davis would be one of those players. I thought he would be gone at this point. He’s watched the tape, the quarterback coach has communicated with Davis, our scouts have been in touch with him and talked to him at various points throughout the year. He’s just one of the guys that wasn’t a priority to Ben to meet because there are only so many guys you can meet with. Q: So the lack of contact wasn’t because you were playing coy, but that you didn’t think it was realistic? A: I don’t know. No, a little bit of both. You try and mix it as a little bit of both. You want to do your research and dig but still not be too obvious about what you want to do. Q: Were you going to take a quarterback in this draft no matter what? A: No, not necessarily. If there was a guy at the right time and was the right guy, we were going to take him. Q: Does he draw comparisons to any other QB’s? Davis Webb, big man with a chip on his shoulder. He’s a gym rat, coach’s son, excited to plug him into quarterback school and hit the ground running. Q: Ben, where does he slide into your depth chart right now? A: He’s a young guy, he needs to come in and see how he does, throw him into the mix and let him compete. Q: What do you like about him? What stands out? A: I think he’s a big man, he’s a fluid mover, he’s a pocket passer but he’s not necessarily a statue back there. He can move around and has some good rhythm in the body. Q: Why does he have a chip on his shoulder? A: He lost a job early in his career, sitting there probably a little bit too long in this draft. Q: You thought he would be drafted earlier? A: I thought he would drafted earlier, yes. A: We had him graded fairly high. Q: Ben, Jerry said you guys called Eli and told him what you guys were doing. Obviously that’s not something you do with other positions. How closely will you monitor how the players react to this? Q: What was Eli’s reaction? A: I didn’t talk to Eli. Q: Do you feel like the offense that you run might be a friendlier transition for someone coming out of an offense like Texas Tech or Cal? A: I think every case is different. You take it on a case-by-case basis and we find out when we get them in the building. A: Again, we liked the way he works, we like the way he leads, he’s a positive player, did a nice job at the Senior Bowl, that helped his cause. Q: Does his performances remind you of another quarterback? A: There are a couple guys out there, but I don’t want to do that to him. Q: For you personally, your only one-on-one time with him when you were in the room with him was at the combine? A: My evaluation was based on film study. Q: Does he fit into the offense in the way that Eli does? Obviously not experience wise, but is he a different kind of athlete? A: Pocket passer. Again, he’s a fluid mover back there. He can move in the pocket and extend plays. He can do some creating. Like I said, he’s not a statue back there. Q: You have not met him before? A: I have not met him. Q: Is there extra gravity brought on by taking a quarterback, especially given the importance of the position? A: That’s a dramatic question, I’m not sure what you’re asking. Q: This is an important decision, I would assume, as a head coach and a franchise, potentially bringing in the quarterback of the future. A: He was the highest player on our board, we had a high grade on him, we felt that there was good value for the pick, and we’re confident that he’s going to come in and develop. Q: Usually when you take a guy in the 3rd round, you expect him to play somewhere, special teams, start, rotation, you don’t expect this guy to play at all. A: He’s not going to be covering kicks for us. Q: How do you weigh that? You get a guy in the third round and say look he might sit for two years. A: Well, you have to trust. There’s a lot of work that goes into it, whether it’s scouts, Marc Ross, the coaches evaluate, the coordinators evaluate, Jerry and I evaluate. You have to trust the process. Q: This is a guy you said you thought would be gone at this point. As the Draft is unfolding, are you thinking in the back of your mind, hoping that he’s going to last? A: Hoping doesn’t work, I tried it. It doesn’t work real well, so you just let it play out, take it pick by pick and when you have someone sitting up there that you graded up there and they’re the highest guy on the board, you’re confident that you did your homework and it’s going to pay off. Q: What character traits have you been able to identify with him that make him the potential franchise quarterback? A: You can see he’s a persistent guy, he’s a hard worker, the game is important to him. Like I said off the bat, he’s a gym rat, he’s a coach’s son and grew up in the game and that helps. He’s going to have to have thick skin like they all do. Let’s get him here and let’s get him a playbook and a helmet. Q: He was the highest player on your board in the 3rd round? A: When we made our pick he was the highest player. Q: Was he close to being the highest rated player in the second round? A: That’s a long way back. Q: Did you have a set idea as to what milestones you want him to reach at a certain point or do you let him develop organically? A: Reps are tough to come by, that’s a big part of the offseason and the way things are with the new CBA. Reps are tough to come by, but they call it development for a reason. It takes different guys different speeds to get you to where you want him to go. We just need to get him in and throw as much at him as quickly as possible and see how he handles it. Q: You said you haven’t met him in person, was that by design? A: No, there’s only so much ground you can cover. Q: How big a benefit do you think it is for a quarterback to come into the league and sit for a couple years? A: I think it’s huge. I think it’s tough to come into the league and be a number two. I don’t think there are very many guys, even in this draft, that can come in and be a number two quarterback. I think it’s challenging, it’s asking an awful lot. It’s a different game and it’s a challenge. It’s a benefit to be able to sit behind especially a veteran quarterback and learn. It goes a long way. Q: You think for developmental purposes it’s better for a quarterback to get in the game right away or sit? A: Case by case, it’s different. Every guy is different, but I do think it helps. Q: You say you never met him, but did you talk to him tonight? Q: What was that conversation like? Q: What was your reaction when you got the call that you were coming to the Giants? A: I was ecstatic. I was very fortunate to be selected by such a great organization and great coaches and Coach McAdoo and I am just very thankful for the Giants organization picking me up today and I am ready to get to work. Q: Ben (McAdoo) said that he was surprised that you were on the board this late. Were you surprised by that, too? A: Yeah, the NFL Draft is a little weird. You really can’t predict it, so anything can happen, but I am just glad that I ended up at such a great organization and so many great players on the Giants team and obviously great coaches. I am just looking forward to being a great teammate and being a prepared quarterback. Q: They have obviously made it clear that Eli Manning is the starter here. They view you as someone who can potentially take the reins. Is that a role that you are comfortable with? A: I don’t know what my role is on the team yet. Obviously Eli Manning is a two-time Super Bowl MVP, so he is one of the best and a Hall of Fame quarterback. So I am just excited to be in the same quarterback room as him and we will see what happens. I am just trying to be a great teammate first, be prepared from a week-to-week standpoint as a quarterback because I have a long way to go. Q: What was this process like for you in the last two days? A: It was all over the place. My emotions were very high and very low, but again, I have had so many great people help me out the past couple days and past 22 years of my life to always stay even-keeled and control what you can control and commit to those controllables and that is what I did tonight and yesterday. It was out of my control and I was just looking forward to seeing who would pick me up and obviously the great organization New York Giants and there are so many good players of the team, so I am just excited and looking forward to heading up to New York very soon. Q: What is your relationship like with Patrick Mahomes? A: Yeah, Patrick Mahomes and I are very close friends. Obviously we were together at Texas Tech and we have kind of stayed in touch ever since then. So it was cool to go through the draft process with him and I am looking forward to seeing how he does in Kansas City with the Chiefs organization and obviously I will be rooting for him. Q: Do you come into this process setting milestones for yourself or do you plan to develop organically? A: I am not sure. I am a very goal oriented type person, but at the same time, I don’t know what my role is yet. I am just a third round draft pick tonight and I am looking forward to being a great teammate first and being a hard worker because those are the two things that I can control and I look forward to doing those two things first. Q: You mentioned there are a lot of things you can get better on. Is there anything particular that you identified as something you want to work on right away? A: Yeah, I have brand new coaches so I am excited to see what we can continue to develop and get better at. Obviously I think that one thing I need to work on is being more efficient mechanically. Coming from a spread type system in college and going to the NFL, obviously every college quarterback needs to develop into an NFL type quarterback, so I am just looking forward to that development and working hard at it. Q: Is there any disappointment that you are not coming to a team where you are going to compete for a starting job right away? A: Not at all. I am just excited to be a part of a great organization. I commit to the controllables, and the Giants thought enough of me to pick me tonight and I am just very thankful for the opportunity and I am looking forward to meeting teammates and getting in the playbook and being in the weight room and just develop relationships and be a great quarterback. Q: When was the last time you were in New York? A: It was a couple weeks ago. I visited the Jets, so that was the last time that I was in the area. Q: What do you see as your greatest strengths as a quarterback? A: I am not sure. I think that I have a couple things that I do a good job at, but at the same time there are so many rooms for improvement in my game. I think that I am a great leader – I was voted a captain at two different schools, so I would say that my leadership qualities are strong. I was a coach’s kid and the only two things that I focus on are being a great teammate and being a hard worker and I think everything else will play itself out. Q: Was your father a quarterbacks coach? A: Yes, he was. He is a head coach at Frisco Centennial down in Dallas. Q: Are you home in Texas right now? A: Yes, I was home for draft night in Prosper, Texas and I had my family over and a few close friends and we were all very excited when the New York Giants called my name tonight. Q: You are going to have the luxury of time with the Giants. Do you view that as beneficial to you? A: I don’t really know what that question entails. Again, I am very happy right now just to be selected to the NFL. I think that every kid wants this dream to happen, so right now I am thankful for the opportunity and I am looking forward to getting to work and being a good teammate. Q: When did you get a sense tonight that the Giants were going to take you? A: Again, I didn’t know which team would take me because there are 32 good ones out there. The New York Giants happened to select me tonight and I am very fired up for them and I am excited to be up there in New York very soon and get to work and learn the new playbook and try to develop into the quarterback that I think I can be. Q: How much did the Giants come onto your radar during this process? A: They were definitely on the radar. There were a lot of teams out there, but I am just very happy that the Giants selected me tonight and I am looking forward to getting up there. Q: Did you talk to Coach McAdoo earlier and if so, what did he have to say? A: Just welcomed me to the team and the organization. I am very blessed by that. I am very thankful to Coach McAdoo and the entire staff and I am looking forward to getting up there. SCOUTING REPORT: Fourth-year junior. Gallman is a well-rounded running back with good size (6’1”, 215lbs), vision, and decent elusiveness and speed. He is a slashing, cutback runner. Gallman lacks explosiveness, but he is very competitive and runs hard. Gallman can pass protect and catch the football. Reese: The fourth round pick we took, Wayne Gallman from Clemson, running back. Wayne’s a versatile back and is very productive. Three years of production there. High level of competition. I think he ended up with 36 touchdowns. We think he can create a lot of competition in that running back group. Very versatile, played on special teams as well. Actually, I think he was a linebacker in high school, so that helps him as a special teamer when those guys play different positions in high school. We thought he was a nice addition to our running back group. Q: How do you think Gallman works with Perkins? A: That’s up to the coaches. We just try and pick a good football player right there. We think he’s that. He’s a three-year producer there. Young kid, tough, kind of linear for a running back. Tall for a running back. I think he’s a little bit over six foot, maybe just six foot. He looks taller when you think about running backs. McAdoo: All right, Wayne Gallman, productive third-year player out of Clemson. (He has) upside in the pass game, comes from a winning program, glad we have him. Q: What did you like about Gallman? A: Again, he comes from a winning program, had a tremendous interview and provides a spark and change of pace. He has a lot of upside. Q: How does he compare or complement (Paul) Perkins? A: Different type of player. He is a little longer type player. He has some speed and we feel like he has some upside in the pass game. Q: He also has good ball security skills. A: Yes, we like to maintain the ball. That is a big part of things and that is a big focus for us this year. He is a productive player. Q: What about Gallman’s interview stood out? A: He was well-prepared for the interview. You could see that he got football; it came clean to him. He did a nice job and was very ready, polished. Q: How ready is Gallman in terms of pass blocking? A: There will be a learning curve there. He has a lot that he has to learn about the pro game. It will be different systematically for him, but again, he did a nice job in the interview. He could really communicate what they were doing offensively and that is a good start. Q: How’d it feel to get the call from the Giants? A: It was a shock. I’m just sitting here waiting and I heard that phone call. I just couldn’t wait to pick it up. I’m just glad to get that call. Q: Why do you say shock? A: I was hearing that I was supposed to go a little earlier than expected. Just this way, I’m relaxing to it and trusted wherever I was going to go through God. When that phone call came, I was just shocked. I didn’t know who it was. I’m glad it was the New York Giants. Q: Just from seeing your tweet, it seems like you’re coming in with a chip on your shoulder it seems? A: Of course, no doubt. Q: How would you describe your running style? A: I’m a hard, physical runner. I believe I have all the aspects in the running game that a running back is supposed to have. I have speed, power, whatever a team needs to get that extra yard. Q: Are you familiar at all with Paul Perkins? A: I watched him in college and watched a couple games from New York last year. I know a little bit about the running game. Q: Do you think that you would compliment him well from what you’ve seen in his style? A: Yes. I think I would be able to complement him and the offense well as well as any other thing that they would want me to do. I’m just ready to come in and work. Q: Reuniting with fellow Clemson player B.J. Goodson? A: Yeah, we have a relationship. I was just working out with him, these past couple of weeks, in Clemson. Q: Will that continue when you arrive in the next couple of weeks? Q: Did you have a lot of battles in practice with Goodson? A: Yeah, a little bit here and there. Q: Are you home right now? What is it like there? A: It’s just me and my mom, my best friend, my dad, and my girlfriend. They are all excited. Q: What is the feedback along this draft process for you? What did you take from what teams were telling you? A: Pretty much, there was really no negative thing I’ve heard. That’s why I really didn’t know who I would get picked by. I knew everybody liked me, I don’t have a bad background at all, and I know my film is good, so it was a just a matter of seeing who was going to call. Q: What was your contact with the Giants? A: Actually, my first visit at the combine, either the first or second visit on Thursday or Tuesday, was with the Giants. I had a really good meeting with them. From then on, I really liked the Giants and Coach Johnson and everything. Q: What made it a good meeting? Did you break down the plays, was it the conversation? A: Conversation, breaking down the plays, and just the vibe that I came into the room with that I felt. I just liked them from then on. Q: Did you have 100 less carries this season? What happened? Why did the number go down? A: I did. We wanted to pass more this past year. It was all on my coach, Tony Elliot. That’s what the coaches wanted to do this past year. We ran the ball but it is what it is. Q: The benefit of that was that you won a National Championship. Q: Do you think that it hurt you personally though? A: I am not trying to think about that, but I do know that throughout the year, those carries were ones that I wanted as a running back, of course. But I will do whatever it takes to win and if that means going out pass blocking and receiving, then I will do that. Q: Who gave you the nickname “Train”? A: Actually, my coach. (Co-Offensive Coordinator/Running Backs Coach, Tony Elliot) and all the Clemson fans. Q: What do you think of it? A: At first I thought it was a little corny, but the more it was used – they ended up giving me a train sound whenever I scored or made a big run in Clemson Stadium, so I kind of just went along with it and accept it now. Q: Did you do more pass protection this year with the offense? Q: How did that go? A: Yes, I believe that I improved over the year. At the beginning of the year, I wouldn’t say that I was doing my best job as a pass protector, but throughout the year I got better with my technique and it got us a championship. Q: What was it like working with Dabo Sweeney? A: Man, working with Coach Sweeney is just like working with a father figure. Coach Sweeney is all about family and just going out there and working hard each and every day. His standard is to just be the best and that is what we did every single day. Q: Did you ever get tackled by Landon Collins? Q: Did you ever run him over? A: No, I don’t think I played against Landon. Q: How about Davlin Tomlinson? A: No, I don’t really remember Davlin. SCOUTING REPORT: Moss began his collegiate career at Nebraska where he was dismissed for an off-the-field incident. Moss has good size with long arms and is a good athlete. Moss flashes as a disruptive run defender and pass rusher, but he needs to get stronger at the point-of-attack. He is a competitor who plays hard. Needs technique work. Reese: Avery Moss, defensive end from Youngstown. Avery is really a true defensive end. You don’t see a lot of those guys these days but he’s a true defensive end that can play the run, rush the passer. Big guy, has a lot of upside. We think he is just now scratching the surface of where we think he can be. We really like his skill set and really think he can come in and help us in that d-line group and at that defensive end position. Q: How difficult was taking Moss as far as character and background? A: Yes, he has had some issues. I think you have talked to him some already but he has had some issues and we think he’s well past those things. We’ll definitely keep an eye on that and if he needs any help in respect to that, we’ll definitely be there to help him. He’s a really well spoken young man that has been through some things. We think he has everything together now. Q: How much did you evaluate that type of situation? A: I can’t talk about some of the personal stuff that we talked about in respect to him, but we had a lot of conversations about it and we feel good at this point. We think he’s gotten past those things. Q: Can you take us through the process on Avery Moss and his checkered past? A: Just like any player, our scouts do an excellent job with digging into the background with the coaches, with his former coaches, off the field. We have tests that we give, a psychological test; obviously, with a person like Avery, who has something that was known, you do extra. That’s what we’ve done throughout the whole process and we felt good about taking him right now, based on his last two years of maturity and the help that he’s received. So we felt good about him as a person. Q: Did you count on Coach Pelini’s recommendation? A: Without a doubt. One of our scouts, Steve Devine, has a very close relationship with him. You have to rely on your scouts and trust the people that they talk to and trust throughout the process. Q: How much is that talked about before you draft a guy? A: We have draft meetings, extensive draft meetings, where we thoroughly vet every single player. Those things are talked about and the way we do our process, which is maybe different than other teams, we kind of go through a mini-meeting about each player as we are approaching our time on the clock. McAdoo: Avery Moss is a physical football player; he has good length, plays with an edge to him. Q: How much did you put into the vetting process with (Avery) Moss? A: We did our homework. Q: Do you feel confident that he is not a risk? A: We feel that he has turned the corner. If he needs any support or help when he is here, we will offer that support. Q: With a player that has been through something like that, do you check that personally? A: We do our homework. Q: How did it feel to get the call from the Giants? A: Oh, man it felt so great. I am here at the Sunrise Hospital in Las Vegas with my grandma – she just had a stroke a couple days ago, so I was just with her and we were ecstatic to get the news. Q: How is she doing? A: She is doing good. She has shown mass recovery in the last week. She is moving faster than any normal patient really does and I wouldn’t expect nothing else from her. She is a fighter. We have been here with her day and night since about Tuesday. So everything has been going well on her end, to God be the glory, everything is good right now. Q: Did this throw off your plans for this week? A: Yeah, we didn’t have a lot planned, but this definitely changed everything. It changed our mood and everything because it is definitely a Lord’s blessing to even have this opportunity. But at the same time, we wouldn’t be here if it wasn’t for my grandmother, so it is just a precise thing of life – we had to be here and she was like the number one thing in my mind. It is a blessing that she is alright and it did change, but it was for the better. We are going to go family first on this one, but I am definitely glad that we were able to be here at the hospital and be able to watch the draft with her and celebrate with her, as she is getting better. Q: Is she awake and alert now? Does she know that you have been drafted? A: Yes, sir. She has a lot of her cognitive skills back, she is aware and everything like that and once I told her, she cried and I hugged her. She knows and she is excited. She said that she always knew I was going to go back to a cold state anyway. Q: What do you think you can bring to the Giants? A: From a defensive end, I know as everything I have had in my life, I have had a lot of adversity. Perseverance is a normal language for me, that is something I am used to and I just keep going through and keep doing. I am relentless when it comes to effort. I never want to give up on a play just because it is never done until the whistle is blown and I think I can definitely try to assist and learn from the D-ends that are already there and then just try to add on in terms of a pass rush standpoint, try to make some noise and help New York get to something big. Q: Can you explain what happened in your dismissal of Nebraska? A: My true freshman year, I came in off 17. I got charged with indecent exposure but that wasn’t what led to me actually getting dismissed. I got dismissed for going into a dormitory hall that I was banned from for a year. It is what it is. I waited to try and get back into the University of Nebraska. They dismissed me and I went to the FCS and coach Bo. I definitely learned from everything. I attended counseling from that incident and am two years graduated from that. It was a blessing not only to have this chance to be a New York Giant and play for the National Football League, but it’s a blessing just to get a second chance to play the game at another university. I felt like I was at my lowest in 2014 when I was dismissed. I was going through a crisis and didn’t know what was going on. I really found my faith with my Lord and savior Jesus Christ. Everything came to balance once I added Him into my life. From there, everything has been good, so to God be the glory. I’m thankful for this opportunity and the road that came with it because it taught me a lot. Q: How much of an impact did coach Pelini leave on your life because you followed him to Youngstown? A: He’s a real life father figure. He may be one of the best coaches, if not the best coach, I’ve had. Another man I would want to have impact my life like he did. He came in from high school and told me, there was a lot of guys that were recruiting me and were telling me that I was going to be a starter and that they could make me an NFL player this and that. He came in and he was genuine and real. He said I may not be a starter there but that he could offer me opportunities. He said he needed me to work hard and this and this could happen. Everyone always sees the yelling coach Bo and all that, but he’s really a good dude. A fun dude. He’s really just the father that you have in the stadium. He cares for his players dearly. He just shows it and he’s a wonderful, good teacher also. He’s taught me a lot about the game of football. I’m sad to be leaving him but ecstatic about the opportunity and blessed that he was in my life. Q: Was there a chance to go back to Nebraska if the coach stayed? A: I was originally supposed to go back. The suspension that I had was only a year suspension. So after that year suspension, I was thinking I was going to come back. They had certain rules and protocols that I had to follow during that year that I was off to get re-admitted back into the university. So I went and did that; was expecting a call saying that I was going to be able to come back. After the end of the year after Coach Pelini was fired, they told me to find another school. That’s when I looked into other schools to go to, and I was going to go to another big D-1, but if I did that, I would have to sit another year out for transferring, so I’d only be able to play my senior year. So I decided to go to the FCS and it made perfect sense. Q: What did you do for that year when you were out of school? A: I worked at a car dealership called Sid Dillon in Lincoln, Nebraska. For a year, I would put in 45-hour weeks, and all that good stuff. That was my occupation for that entire time, from January to January. Q: At that point did you think you would be in this position someday? A: No, sir. I definitely was in a weird space, where I was trying to find myself. SCOUTING REPORT: Fifth-year senior. Bisnowaty played left tackle at the collegiate level but could project to right tackle or either guard spot in the pros. Bisnowaty looks the part with a good frame (6’6”, 304lbs) with long arms and huge hands. He lacks ideal agility in pass protection and mauling power as a run blocker, but he is a scrappy player with good intangibles. Smart, tough, and aggressive. Bisnowaty works to finish his blocks and has a mean streak. Somewhat injury prone. Reese: Bisnowaty, a tackle from Pittsburgh. He played a lot of football for them. A big guy that is tough and rugged. He’ll get into our offensive line group and challenge for a spot there as well. Q: Do you see Bisnowaty as a tackle or a guard? A: We think he’s a tackle. We’ll start him out at tackle. That’s the coaches. They can do whatever they want to do with him. I think he’s a tackle. Q: You traded up seven spots and gave up a draft pick to get him. Why? A: We thought that there wasn’t a lot left on the board in respect to offensive line. He could’ve easily been there but we had a little huddle and said let’s go get this guy if we can. We gave up our seventh round pick to get him. Q: How important was it to get an offensive lineman in this draft? A: We wanted to help the offensive line but we didn’t want to reach for anyone and we did that. We always want to help every position and offensive line is a position that we tried to help, but again, we’re not going to reach for anyone. Q: Jerry Reese mentioned that you traded your 7th round pick because no one at the top of your board was left, is this true? A: Yes. We felt really good about Adam Bisnowaty and we didn’t want to miss out on him, compared to some other people that you may have to wait on in the sixth, and then wait on in the seventh round. We felt that he was worth packaging those two picks to get. Q: Waiting until the sixth round to get an offensive lineman, is it safe to say that you guys thought this offensive line class was bad? A: We stuck to our board from the first round until the sixth. We’re not going to reach. If we feel like there is a player of value and need at the right place and the right time, we are going to take him. We’re just not going to jump over players that we feel are better players who can contribute to reach for a perceived position of need. Q: The offensive line is perceived as a position of need. Do you look at it like you really need an offensive lineman? A: We look at it as we need good players at every position, at every position. Q: It was a perceived position of need with others and you got one. Why so late for a tackle? A: We took six players. How many positions are there on the field? Ten. So you can kind of check, oh man we could’ve got four, maybe if we had four more picks we could have got those. We’ll see when we get in free agency. Q: Is it fair to say that inside this building you feel better about your offensive line than outsiders? A: Probably inside this building we feel better about a lot of things than most outsiders feel. We say left, you guys say right. We say up, you say down. It’s just the nature of what we do. We trust the people that we have here from the coaches to the scouts and that’s what we have to rely on. 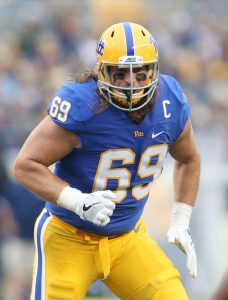 McAdoo: Adam Bisnowaty is a tackle or guard from Pitt. He has played a lot of football for them, has been a productive player, he is a physical player and we are glad that we have him. Q: Where will Bisnowaty play? A: It is still early. We are going to bring him in, see how he can play on both sides, both right and left, move him around a little bit and we think he has some flexibility inside as well. Q: Will he play tackle initially though? A: We will start him at tackle and see how he does. Q: Bisnowaty said that he is a nasty football player. Is that something that you want in all of your linemen? A: I don’t know that it is the most important quality, but it is nice to have someone that plays physical with that type of physicality and likes to finish plays and plays nasty and he is also from God’s country. That helps him. He is a good, physical football player. We are glad to have him. He fits our profile and has played a lot of football at a high level. A: It was awesome. Just sitting here and watching, it is an unbelievable experience and opportunity I have in front of me and I am excited to get started and to get there and get rolling. Like I said, it was awesome. Q: The Giants traded up to get you. How does that make you feel? A: I think it says a lot about how they feel about me, which is great. I am ready to come in and get going and start hitting the field and just get out there and help the team to win that Super Bowl. I think it says a lot about how they feel about me and I am pretty excited about that. Q: Are you a tackle or a guard? A: I think it is whatever they feel like they want me to do. I played a lot of tackle at Pitt and a little bit of guard, but I am willing to play either one, so wherever the best fit is for me and the team and however we are going to win the most games is going to depend on where I play. I am excited to play either one. Q: How would you describe your game? A: I am a nasty football player. I get after people. That is something that I am very proud of – I am out there and I am physical every play, making sure that the guy across from me wants to quit. Everything I do on the field is nasty and physical and I take myself off the field with the preparation and I take that to the next level, so that when I get out there it is all football. Q: What do you think you have to work on the most? A: I think just continuing to work on the details of my fundamentals. I think it all comes back to that offensive line play and fundamentals are huge. If you continue to work on those every day and I think just continue to learn, keep learning, keep perfecting my game and skills every day and that will help me to become a better player and to succeed. Q: Do you know much about the Giants offensive line situation right now? A: Yeah, I know a little bit. A few years back they drafted a few guys and they have a few guys starting right now and there are some opportunities and right now I am just excited to come in there and get out there and do the best I can and help contribute to this team. I think that is my main thing coming out there. Abdullah is a super-productive, instinctive, small-school running back who lacks ideal size and speed, but he can make defenders miss. Smith is a classic lead-blocking fullback who rarely touched the ball in college. Gym rat who is super strong. Smart. Good special teams player. Rudolph lacks size, speed, and agility, but he plays better than he tests. He runs good routes, adjusts well to the football, and has good hands. Competitor who will block. Johnson is a big possession receiver. Williams is a tall, athletic receiver with very good hands. He averaged 19.3 yards per catch in 2016. However, Williams missed all of 2015 with a leg injury and was nagged in 2016 with ankle issues. He also has had off-the-field problems (arrest in 2015). Wheelright has a nice combination of size and overall athletic ability. Lacks ideal speed and his hands are just so-so. He doesn’t play to his size and has been regarded as a bit of an underachiever. Good run blocker. Snead is an extremely fast but raw, small-school player who has some experience at both corner and wide receiver. He only had five catches in college. Snead did return kickoffs in college. Lane is a big, physical receiver who lacks ideal speed and quickness. Lane will make the tough catch over the middle but may struggle to separate from NFL defensive backs. The Giants signed C.J. Germany in August 2017. The 5’11”, 180-pound Germany was originally signed as a rookie free agent by the Los Angeles Rams after the 2017 NFL Draft. The Rams waived him in August 2017. Thompson is a blocking tight end who rarely touched the ball at Temple. Although he did not test well athletically, Wheeler combines good size with decent overall foot quickness at left tackle. He is a solid technician who plays hard and enjoys the game. Tough and aggressive. However, he had injury and off-the-field issues in college. Wheeler is a better pass protector than run blocker and he needs to get stronger. Dunker is a big, athletic guard who needs to get stronger and dedicate himself to the game. He does not play with much power and he needs a lot of technique work. Raw, but has an upside. Brooks is an athletic but raw, small-school prospect who lacks ideal size. He is versatile, having played both tackle and guard. Brooks was signed by the Kansas City Chiefs after the 2017 NFL Draft but waived in June. The Giants signed Richard Levy in August 2017. The 6’6”, 315-pound Levy was originally signed by the San Francisco 49ers as a rookie free agent after the 2017 NFL Draft. The 49ers cut him in August 2017. Schwan is a big defensive end who was an ascending player at Penn State late in his collegiate career. Smart and hard working. He is a better run defender than pass rusher as he lacks ideal quickness. Huge, strong defensive tackle with very long arms. He can stack at the point-of-attack against the run and flashes as a power pass rusher. Too fat and lacks ideal overall athleticism. Work ethic and competitiveness have been questioned. Jones has an upside but he has to want it. Athletic, undersized defensive tackle who flashes the ability to disrupt and make plays in the backfield. Banks was suspended by his team for three games in 2015 for unspecified reasons. Three-year starter who was a team leader at SDSU. Munson has good size, but lacks ideal agility. He is a better run defender than in pass coverage or blitzing. Smart, physical, aggressive, instinctive, and productive. Herman was signed by the Giants as a rookie free agent in August 2017. Herman attended the New York Giants rookie mini-camp in May on a tryout basis, but was not signed. He has a nice combination of size and athleticism. Herman played in eight games his senior season, and accrued only 28 tackles. Casher was signed by the Giants as a rookie free agent in August 2017. Casher was originally signed by the Oakland Raiders as a rookie free agent after the 2017 NFL Draft. The Raiders waived him in early August. A highly-regarded prospect coming out of high school, Casher has good size (6’4”, 260 pounds). Casher suffered a number of serious knee issues and was involved in off-the-field incidents at Florida State before transferring to Faulkner University. Experienced corner who started games every year at Iowa State. He was suspended for a drunk driving arrest his senior year. Amos is an average-sized corner with decent overall athleticism. The Giants signed Daniel Gray in August 2017 after he was waived by the Arizona Cardinals. Gray was originally signed as an undrafted rookie free agent by the Cardinals after the 2017 NFL Draft. Robinson is a physical safety with decent size and overall athleticism. Johnson has a nice combination of size and overall athletic ability. Well built. He is instinctive in coverage, has good range, and makes plays on the football in the passing game. Better in zone coverage as he can struggle in man coverage. Johnson is not a physical run defender or tackler. He needs to become a tougher football player to make it. The draft is not always about addressing immediate needs. A good team is lucky if more than two of their drafted players start as rookies. Savvy, secure, and stable front offices think beyond the upcoming season in terms of how a roster is constructed for the long term. That said, free agency and the salary cap have put more pressure on teams to select players who can contribute sooner rather than later and thus, on the value vs. needs spectrum (and debate), “need” has become more important as the years have passed. 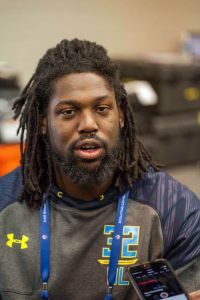 Heading into the 2017 draft, the Giants had glaring needs at defensive tackle and tight end. The team also ideally wanted to address talent and depth concerns at running back, the offensive line, linebacker, and in the secondary. Then there was the elephant in the room that some fans did not want to acknowledge – the Eli Manning era could be coming to a close in three years. As is the case each year for every team, there were more needs than available resources (the Giants entered the draft with seven draft picks). My views on this draft come with a subjective bias. I did not like this offensive line class and thus, I was very much worried the Giants would reach and draft a sub par offensive lineman with an early pick. Teams appear to have agreed. Only 33 offensive linemen were drafted, with only 10 drafted in the first three rounds. The last time an offensive lineman was not drafted this late was 1982. You may have had your favorite OL prospect passed on by the Giants (and most other teams), but how good a prospect would that player have been in a “normal” offensive line draft? In fact, had 23-year old Ereck Flowers been a prospect in this draft, he probably would have been the first offensive lineman drafted. The selection of Evan Engram did not surprise me. I had a sneaky suspicion he was going to be the pick and heard from two sources before the draft that he was definitely a first-round target. And I would not be surprised if the Giants had Engram rated ahead of tight end O.J. Howard, who went four picks before the Giants selected. They certainly had him rated ahead of tight end David Njoku, who went six picks later. Let’s get this straight: Engram is not a true tight end and he never will be. One look at his frame will tell you that. He’s a hybrid, a TE-WR ‘tweener. It’s a different game now. The days of Mark Bavaro, Zeke Mowatt, and even Howard Cross are gone. For better or worse, we’re moving more towards Arena League-style football. It’s happened in college and now it’s happening in the pros. Free agent Rhett Ellison – who has averaged 10 catches per season in five years – will be the in-line, blocking tight end. Engram will be used everywhere: H-back (move tight end), slot, out wide, out of the backfield, and sometimes in a traditional in-line stance. The fact that he was drafted tells us that it was not McAdoo’s preference to be in “11” personnel (1-RB, 1-TE, 3-WR packages) all season in 2016. That will change now. Most importantly what will change is opposing defenses ignoring the Giants tight ends and playing exclusively two-deep coverage. Engram’s presence alone will help open things up for Odell Beckham and Brandon Marshall, or Engram will torch opposing secondaries all day long down the middle of the field. Engram is not as field-fast as his 4.4 time suggests, but he will be one of the fastest (if not THE fastest) tight ends in the NFL. He’s smart, he knows how to get open, and he can catch the football. The most used word to describe him? Play maker. Why did the Giants struggle to score last year? Yes, the offensive line was an issue. But the bigger issues were Rashad Jennings, Victor Cruz, and Larry Donnell/Will Tye were not very good. The Giants offense is now a MUCH different creature and will be very difficult to defend if the quarterback plays well and the offensive line plays at even an adequate level. With the loss of Johnathan Hankins, I thought defensive tackle was the most glaring need on the team. Not only were there only three defensive tackles on the roster, but two of them (Jay Bromley and Robert Thomas) have been career back-up types. All-Pro Damon Harrison can’t do it all by himself. You can’t game plan around not having a defensive tackle. And God forbid Harrison gets hurt. The entire defense could fall apart. Enter Dalvin Tomlinson, who was one of the best run-defending defensive tackles in the draft. 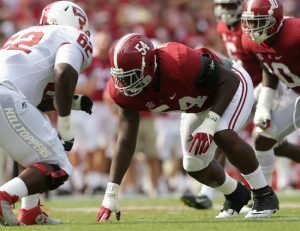 Moreover, Tomlinson – given his size, strength, intelligence, and Crimson Tide pedigree – has an excellent chance to start from day one. Tomlinson was asked to two-gap a lot at Alabama. Freed to one-gap more with the Giants, he actually may end up being a more disruptive pro player than college player. Tomlinson is my favorite player the Giants drafted. The lightning rod selection – as it always is on every team – was the quarterback. Most quarterbacks drafted do not become “franchise” quarterbacks. And those odds dramatically decrease after the first round. Despite some talk of the Giants being interested in drafting Pat Mahomes (who went 10th), the Giants were not in position to draft him or Mitchell Trubisky (2nd overall) or Deshaun Watson (12th). One could argue that this was not a great QB class and it would have been an exceptionally risky proposition not only to draft one in the first round, but worse, give up multiple future premium picks to do so. So after the top three were gone, I was personally happy the Giants did not draft a quarterback in rounds one or two. Now some argue that given the batting average of drafting a quarterback past round one is not good, drafting a quarterback in round three is a waste of a draft pick. (Hanging over this discussion is the team’s abysmal record of drafting players in the 3rd round in recent years). However, teams cannot afford to think that way. Where would the Cowboys be had they not drafted Dak Prescott in the 4th round? The Giants had a second-round grade on Davis Webb. When he fell to the third round, they pounced. Will he be the next Eli Manning? The odds say no. But Webb has the tools – he has the size, arm, intelligence, and work ethic. Does he have “it”? Only time will tell. But the good news is that Webb has some time to develop and he has a good system and coaching staff to work with. Given the talent and depth at running back in this draft, the 4th round was an obvious spot to select a running back and that’s what the Giants did with the pick of Wayne Gallman. The Clemson prospect had a monster year in 2015, saw his productivity slip in 2016, but he became a more well-rounded player. He’s a big-time player from a big-time program who has scored 30 rushing touchdowns in two years. The only second-guessing here will be from those who wonder if the Giants should have selected a different running back. Gallman will have a legit chance to win the starting running back spot from Paul Perkins. The late rounds is where scouts really earn their keep. This is where lesser-known players with some warts – including character concerns – get drafted. Teams have to do their homework and determine if these players have a credible chance to eventually make an impact at the pro level. Avery Moss is one of those “who?” guys that after closer inspection seems worthy of the late-round selection. Moss was kicked out of Nebraska for an off-the-field incident that the Giants have investigated. He’s a two-way defensive end (difficult to find late in the draft) who can rush the passer. That will be his ticket if he is to unseat Romeo Okwara, Kerry Wynn, or Odighizuwa Owamagbe from a roster spot. Those three did not get enough heat on the quarterback. Moss flashes that ability. He did so both at Nebraska and Youngstown State. To those fans who say, “why do we need another end?” I would respond remember what happened to the pass rush once JPP left the line-up. The Giants – like all teams – need to add pass rushers. Getting Adam Bisnowaty in round six was a bit of a coup. The Giants gave up their 7th rounder to move up seven spots to do so. No, Bisnowaty is no sure bet to solve the Giants offensive line woes (or even make the team). But he was regarded by some as a 4th round-type talent. Bisnowaty may not be pretty, but he’s the kind of scrappy player who survives a long time in the NFL (think David Diehl, Brad Benson, Rich Seubert). If the Giants had drafted Bisnowaty higher than they did, no one would have blinked an eye. And the Giants got another player like that after the draft when they signed undrafted rookie free agent Chad Wheeler, who had not it been for a down 2016 season and an off-the-field incident, would have been drafted and possibly quite high. I would not be shocked to see Wheeler starting for the Giants at some point within the next couple of years. Small school offensive line prospect Jessamen Dunker is raw but extremely athletic. He also can play both guard and tackle. Dunker may take a couple of years to develop, but he has a shot. Other undrafted free agents of note are Shane Smith, who could earn a roster spot by default if the Giants want a fullback on the roster. Travis Rudolph was a super-productive wideout from a major program. He could be one of those players who simply doesn’t test well, but is a player. Colin Thompson is a college rarity – a tight end who can block. Jarron Jones flashes tremendous ability at defensive tackle, but he won’t make it unless he takes the game more seriously. Both linebacker Calvin Munson and free safety Jadar Johnson have a legitimate chance to make the 53-man roster. My only surprise and disappointment is that the Giants only added one rookie corner (rookie free agent Nigel Tribune) in what was regarded as a strong defensive back class. Overall, this looks like a respectable effort with the wild card being Davis Webb. What is interesting is that every drafted player, with the exception of Avery Moss who transferred from Nebraska, came from a major program. Evan Engram will elevate the Giants’ offense to a different level. Dalvin Tomlinson has a good chance to start and become an outstanding pro. 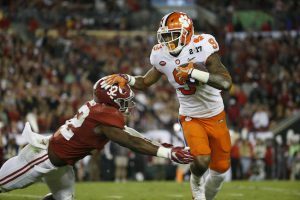 Wayne Gallman has a chance to win the starting running back job. And the Giants did add some rookie offensive linemen who have a chance to be a factor down the road. The rookie free agent class is strong. If Webb becomes a good pro player, then this draft moves to a different level. Though not official, the New York Giants have reportedly signed the following 16 undrafted rookie free agents. However, sometimes these reports are in error as some of these prospects are tryout players who have not signed contracts. The Giants will hold a rookie mini-camp on May 12-14 at Quest Diagnostics Training Center. Those participating will include the team’s six 2017 NFL draft picks, signed rookie free agents, and rookie and street free agents invited on a tryout basis. Raw, but massive and strong guard who needs a lot of technique work. Not a bad athlete and he has a bit of a mean streak. 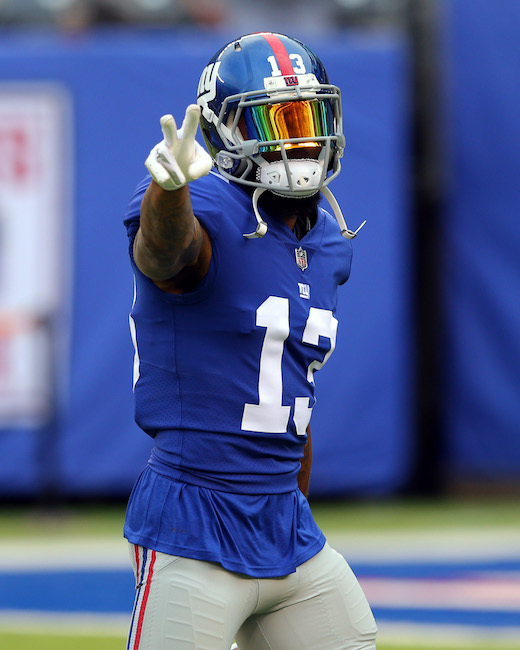 As expected, the New York Giants have officially picked up the fifth-year option for wide receiver Odell Beckham, Jr. on his rookie contract. That means that Beckham will not become a free agent until after the 2018 NFL season. Beckham will earn $1,839,027 in salary in 2017 ($3,311,063 overall cap hit, including prorated signing bonus), but will now see his salary spike to about $8,000,000 in 2018. Forum Post: So, what s your best guess? Not your best hope.